Sending Harley Quinn to Hollywood is a win-win scenario. It’s the perfect sort of insanity for her kind of comic, and Conner, Palmiotti and guest artist Timms pull it off splendidly. 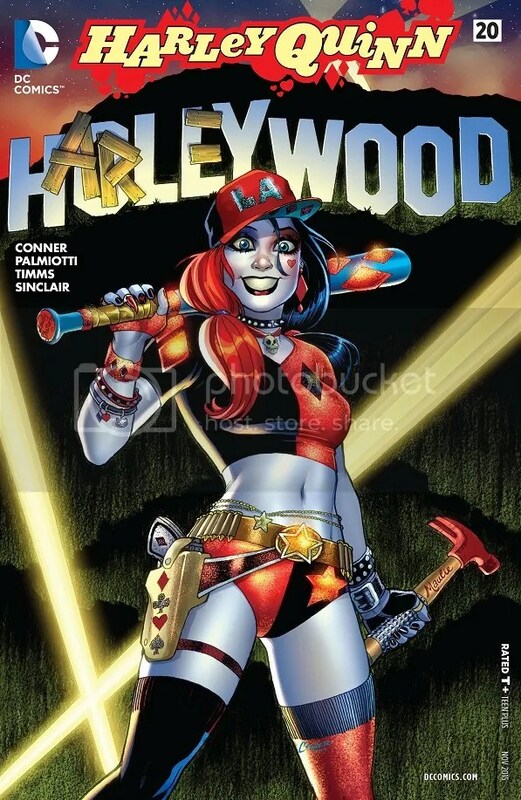 Harley travels to Hollywood to try and find Sparrow Adaro. She has some wacky adventures on the airplane, with baggage claim and at a big time Hollywood party. The party gets robbed, but Harley beats up the robbers, then gets arrested, then steals the cop car, then randomly meets a guy who goes around dressed as a cowboy. Harley and the cowboy eventually find Sparrow at a different party, and find out that Sparrow ‘kidnapped’ herself and she’s been squeezing her mother for money using that ‘cult kidnapping’ lie. So Harley kidnaps Sparrow to detox the girl to send her home, and they tie her up in a seedy motel room while Harley and the cowboy hit the town. They have a wide variety of strange little adventures — including meeting someone dressed as Harley Quinn at the Walk of Fame — before returning to the motel. But suddenly, they’re ambushed by the guy that Sparrow’s mom originally wanted to hire — Deadshot! I apologize if my synopsis recap was a little stuffed, I was trying to capture the madcap intensity of this issue of Harley Quinn. A new scene takes place on almost every page, and I even had to leave out a lot of details. She goes from a baggage claim joke to killing an airport employee to bantering with a naked movie producer to killing a bunch of robbers in a matter of pages, and that’s only the open salvo. This means a lot of zany fun, which can be both a blast and kind of silly. I’m leaning more towards the fun side, because this creative team is definitely enjoying themselves. The scene with the Harley personator in particular was a hoot. Timms handles himself well with art duties. He’s got a lot of weird characters to draw, and he does a fantastic job keeping everyone straight and making sure they stand out. This new Hollywood adventure doesn’t have the foundation or the heart of other Harley tales, but it doesn’t need either. This is just a solid, enjoyable showcase of the sort of wackiness one gets from Harley Quinn, and I know I had fun. Now it’ll be interesting to see what Conner and Palmiotti do with Deadshot. 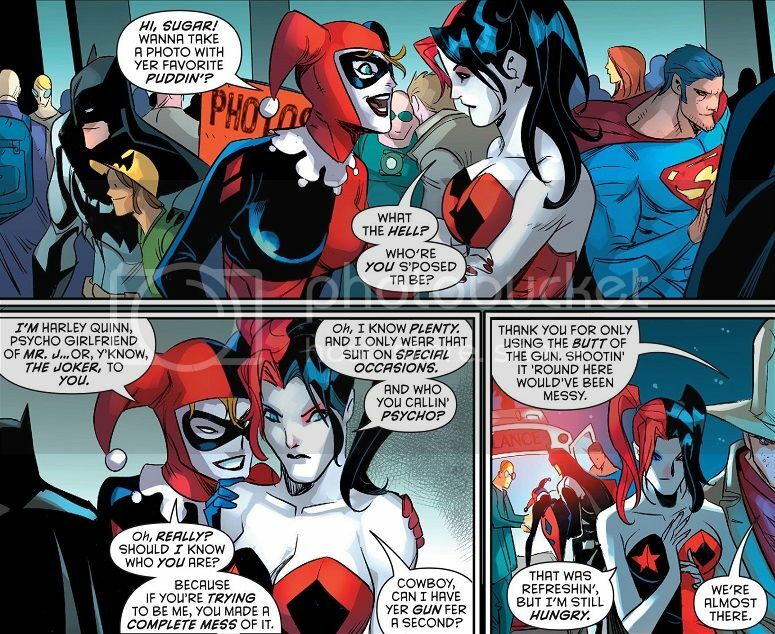 Back at the start of the New 52, Harley and Floyd were a bit of an item in the pages of Suicide Squad. And while Harley’s solo title has clearly eclipsed her previous appearances, I’m hoping the team finds a great way to incorporate Deadshot. They’ve shown a lot of skill when it comes to building and using Harley’s supporting cast. The inevitable has happened! The original creative team on Lumberjanes, the ones that made it a comic darling, have mostly left. But we have to trust that writer Shannon Waters has found a solid team to carry on the adventure, and they pretty much succeed! 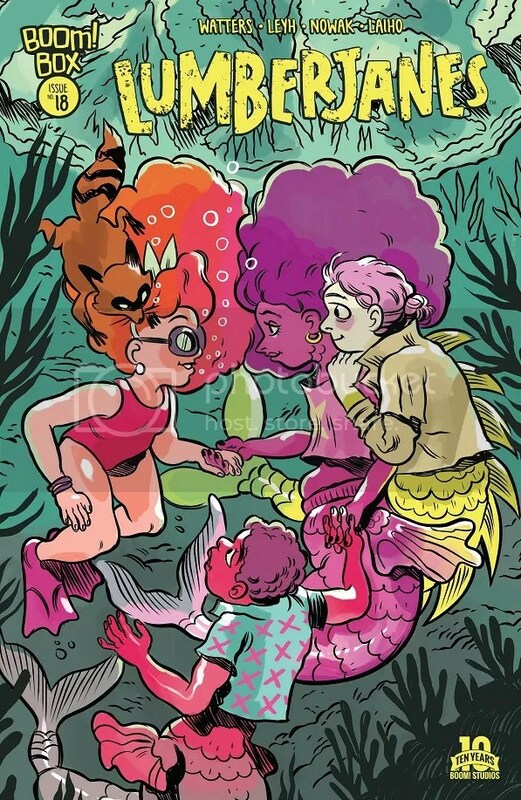 While hanging out by the lake, the Lumberjanes meet a mermaid named Harlow, then get wrapped up in Harlow’s drama with her mermaid rock band. April had a childhood love of mermaids, so she convinces her friends to stay at the lake and help Harlow get the band back together! I’m happy to say that the new creative team does not disappoint! The issue isn’t jam-packed with the same sort of adorable wackiness, but everybody comes close enough to produce another enjoyable issue of Lumberjanes. The mysteriousness of the forest is traded away for a very human-like underlake world of mermaids, but I can roll with that. It’s a very Lumberjanes-y idea to get a mermaid rock band back together, especially when the creative team revels in the fun of having April shout, “We’re getting the band back together!” The Lumberjanes team know their audience, and they know how to have fun, and that’s what counts. The new art takes a little getting used to, but I’m down with that as well. As the first story arc of the new Secret Six draws to a close, I’m beginning to hone in on what went wrong. I hated the first few issues with a passion, but the last few have tapered off and actually been enjoyable. The answer is kind of simple: Simone is great when it comes to the camaraderie of her team, but getting this new team together was a little awkward. Plus she totally flubbed the opening conflict. The Riddler and his goons have the Secret Six cornered — but Strix is a beast and quickly kills all the goons, then Catman beats the living daylights out of Riddler. But then Sue Dibney reveals that she’s been brainwashed and works for Riddler, and the dock has been rigged to blow! Ralph won’t let the others hurt Sue, so a fight breaks out between Big Shot and the rest of the team. Meanwhile, the dummy reveals that he’s not only ‘alive’, but he’s the one who stole the Riddler’s gem. Riddler then makes his escape, Sue blows the dock and everybody swims to safety — but Black Alice didn’t make it, and she dies in Ralph’s arms! The Riddler totally fails as the bad guy in this series. He feels like an afterthought, like Simone couldn’t have her first choice so she just picked someone random, completely ignored everything the character has done in the New 52, and just went with classic Riddler. I mean, come on. He’s got a squad of Riddler-dressed henchpeople? He’s in love with Sue Dibney and wants to propose to her? He’s obsessed with some gem? 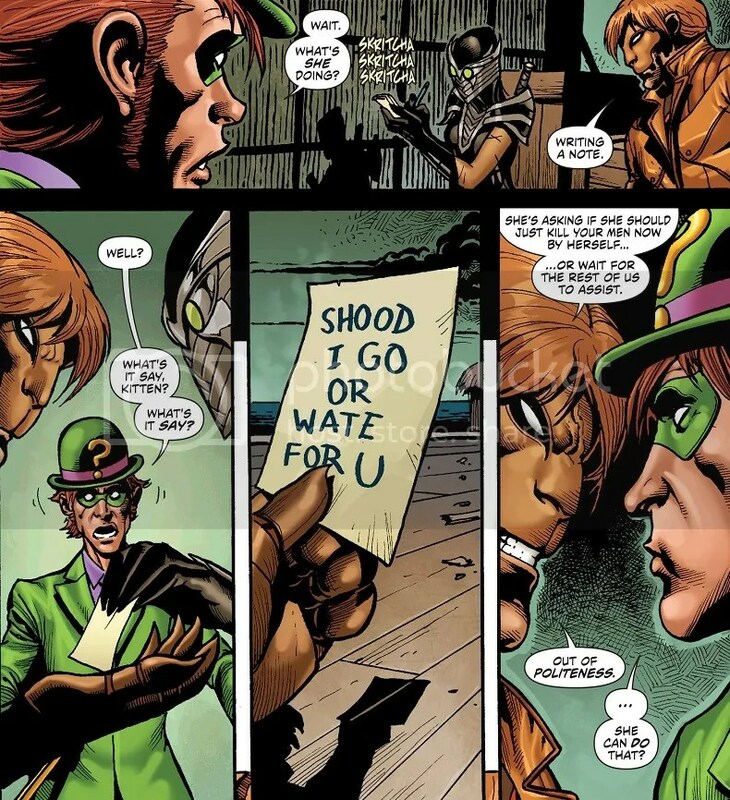 And nothing about his scheme involving the Secret Six has anything to do with Riddlers or cleverness or anything. As a villain, and as a plot, Riddler and everything tied to him is hugely ridiculous. I don’t even want to try and piece the master plan together. But there is some joy to be had from the interplay of the teams, and I only mean ‘some’. Porcelain remains a total throwaway character, with absolutely zero impact on the proceedings. Black Alice and Big Shot have a nice friendship, but there’s still no reason why Black Alice was put in that role. And with the revelation that the Ventriloquist’s dummy is a living, thinking person, she is pushed further into the background as well. But Simone is doing a nice job building up the weird friendships between Catman, Strix and Ralph Dibney. That little group echoes the joy of the earlier Secret Six, and makes this issue passably entertaining. 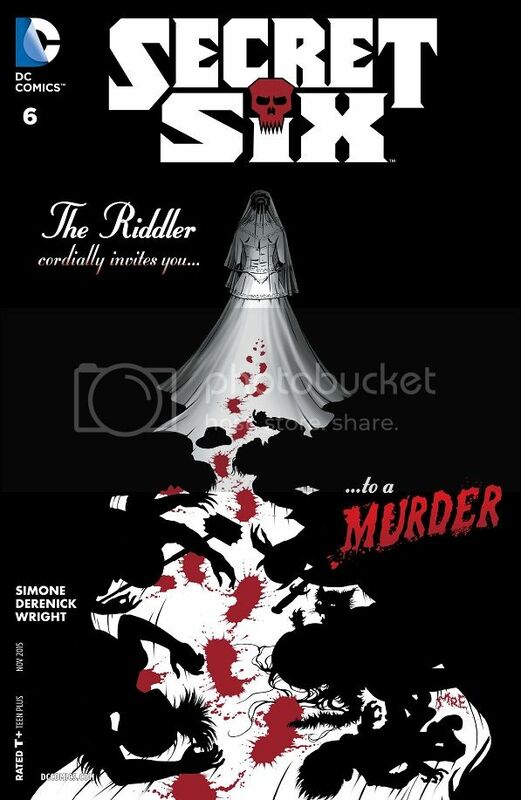 Gail Simone really flubbed the launch of the new Secret Six. The art has been all over the place, and her opening storyline is embarrassing. But there are hints of the joy from the first volume, and I hope she focuses on that going forward. This issue of Star Wars, more than any other so far, makes it clear that Jason Aaron and Marvel have settled in for the long haul. The big, bombastic opening storyline is over, and now it’s time to tell new, original and hopefully interesting stories. They’re off to a good start. On the gas planet, Leia, Han and Sana fight back against the TIE pilots and manage to escape on Sana’s ship. Meanwhile, on Nar Shaddaa, Luke Skywalker manages to recover his lightsaber, but he falls prisoner to Grakkus the Hutt — who just so happens to be a collector of Jedi artifacts. He forces Luke at gunpoint to use the Force to open several Jedi Holocrons he has stored around. When Luke is successful, Grakkus informs the boy that he will be the latest addition to the Jedi collection. Fortunately, R2-D2 manages to get a distress signal out to the Rebel Fleet, but they can’t afford to send anybody to rescue Luke. It’s OK though, because Chewbacca volunteers! Man, that Chewbacca moment at the end had me grinning from ear-to-ear. 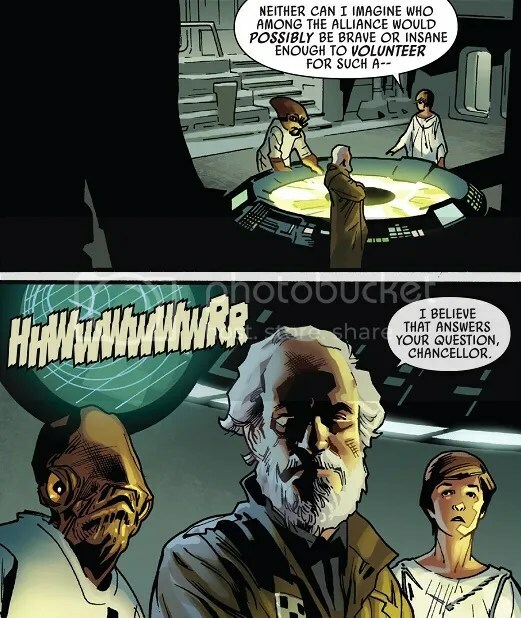 Aaron really built up to it to, letting the Rebel leaders wonder aloud who might be crazy enough to attempt this rescue mission on the pirate planet Nar Shaddaa, and then Chewbacca just steps up to the plate! I can’t wait for his upcoming solo series! The rest of the issue was just plain fun all around, with some really solid storytelling. The bit with Han Solo’s ex-‘wife’ hasn’t really clicked for me yet, mostly because nothing has really happened with that story in awhile. Ever since her first shocking reveal, the three characters have just been standing around talking to each other in pretty much the same spot. Fortunately, Luke’s story easily carries the excitement this issue. Aaron is exploring a very interesting part of Luke’s life, how he started to learn even the basics of being a Jedi with Obi-Wan dead and Yoda still in the future. Having Luke fight pirates, face off against a Hutt and find himself in a mysteriously awesome stolen Jedi archive is just a cool story. Star Wars has settled into needing to tell ongoing stories. It can’t just rely on the name recognition anymore. And Aaron and Immonen easily show that they have a lot of fun stories in mind going forward. 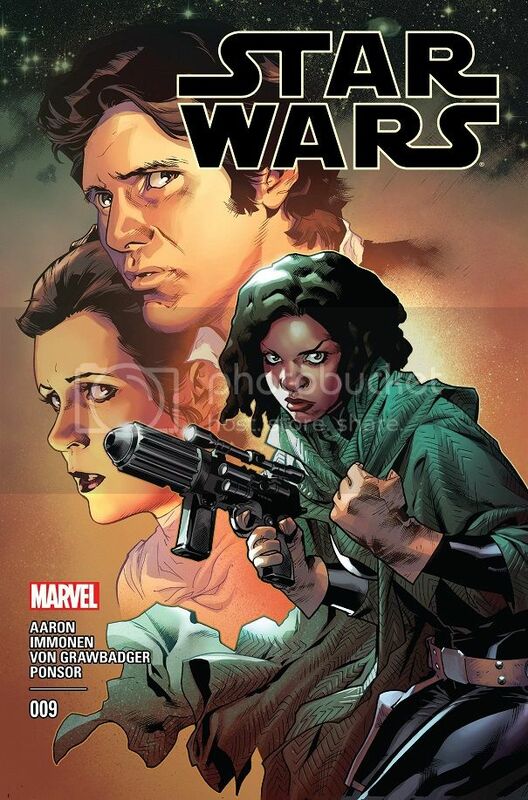 Posted on September 19, 2015, in Comics, DC, Marvel, Reviews, Star Wars and tagged Boom!, Catman, Chewbacca, Harley Quinn, Luke Skywalker, Lumberjanes, Secret Six. Bookmark the permalink. 2 Comments. Does this mean you can finally play Arkham Knight?? It does! Once…er, uh…they actually release a version that works correctly on the PC!